iMedia Speaks Kentico Hosting | IMEDIA Inc. So, you have a Kentico website. 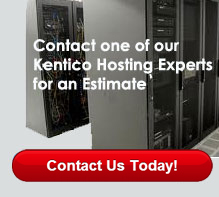 Don't you want to host your website with a service provider who speaks Kentico? iMedia is fluent in both Kentico and hosting. Our Kentico Hosting solution allows you to custom build a hosting solution that meets your business needs. We're proud of our 99% uptime and our excellent record of client satisfaction. Through iMedia's hosting facility, we host sites without either strict disk space or bandwidth limitations. We work with you to custom-build a hosting solution that meets your business needs. Shared or dedicated, Windows or Linux, clustered or stand alone – iMedia develops safe and strong servers to host your Web site. Our hosting facility is colocated in a Class One network operations center, with all the benefits that you'd expect. We monitor our network 24/7, with onsite support during the working week, as well as email and pager support on weekends and holidays. We're fully conversant with the latest data protection needs and, of course, fully back up your site nightly.Visit the page below to learn more about iMedia's Kentico Hosting Solution and to get in touch with one of our Hosting experts.